Gore spoke on global warming and the dangers it poses to the public’s health. In his approximately one-hour address, Gore began by discussing the threat it presents. “It is the largest and most serious challenge human civilization has ever confronted, and yet we have not reached a point where the world’s political systems are ready and willing to really do what’s necessary to solve this crisis,” Gore said. For the real news you'll want to read this report from Steve Denton, one of the writers for Open Pen, a slick new blog featuring a variety of viewpoints on local and national politics from local writers. One of the treasures in our area is our NPR affiliate, WETS. They are in the midst of their fund raising activities which will be assisted by none other than my idol, (gravelly-voiced, get the truth, take no bull, send me to jail then you fascists) Amy Goodman. She is the host of Democracy Now! 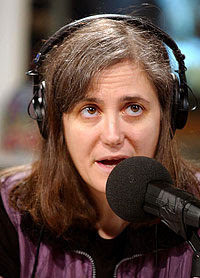 which airs on WETS weekdays from 6-7 p.m.
Amy Goodman is coming to Johnson City on April 7th. She will be at the Culp Center on ETSU's campus. Snad has details at Concerned Tennessee Citizens. DN! is probably the most popular and certainly the most controversial program on WETS. In a media world saturated with the likes of Limbaugh and crowd, this program is exactly what this area needs. Amy has written a new book, Standing Up to the Madness: Ordinary Heroes in Extraordinary Times. Standing Up to the Madness not only is a timely, inspiring, and even revolutionary look at who wields the greatest power in America--everyday people who take a chance and stand up for what they believe in--but also offers advice on what you can do to help. Where are the millions marching in the streets to defend human rights, civil liberties, and racial justice? Where is the mass revulsion against the killing and torture being carried out in our name? Where are the environmentalists? Where is the peace movement? The answer: They are everywhere. The award-winning sister-brother team of Amy Goodman, host of Democracy Now!, and investigative journalist David Goodman traveled the country to detail the ways in which grassroots activists have taken politics out of the hands of politicians. Standing Up to the Madness tells the stories of everyday citizens who have challenged the government and prevailed. They are right here in the Tri-Cities. Who? The one reading this blog right now, that's who. You. To make sure this important program stays on the air, an organization called Democracy Now! Tri-Cities was formed. It is the brainchild of Joseph Fitsanakis. He blogs at Intelligence News. (If you scroll way down on the sidebar you'll find me and the monkey as proud non-intelligence links). We are the organized listener base of Democracy Now! radio program in northeast Tennessee, southwest Virginia and west North Carolina. We aim to (a) ensure that our local NPR station, WETS FM, will continue to broadcast Democracy Now! in the future; and (b) utilize Democracy Now! as a powerful vehicle for bringing together progressive people and organizations in our area. Democracy Now! is America’s most successful progressive news program, airing weekdays from 6-7 pm on WETS FM. Join us today! When you make a pledge to WETS, make sure you tell them how much you appreciate Democracy Now! Here are other ways to help. If you are near our mountain, make sure you catch Amy Goodman in person at ETSU on April 7th. And, First Presbyterian of Elizabethton is excited to have Joseph Fitsanakis speak at our adult forum on April 12th and 19th. The title of his presentation is "We Can't Accomplish our Middle East Objectives with War." Join us Sunday mornings at 9:45. Wow. When you put all those great links up it doesn't look like such a Limbaugh wasteland after all, does it? Thanks for the Open Pen plug my man.